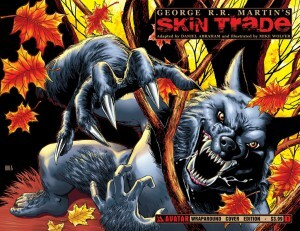 Straight from the Press Release at Previews magalog: “George RR Martin returns to comics with his World Fantasy Award winning story, Skin Trade! With scripting by Martin’s long-time partner, Daniel Abraham, and art by horror legend Mike Wolfer, Skin Trade is set to be one of the must have comics this summer. Private investigator Randi Wade sees the ravaged remains of innocent victims that have been savagely murdered and skinned alive. As the mysterious secrets of the Blackstone Manor begin to be uncovered, she gets ever closer to the monstrous truth…werewolves are real!” Look for it monthly in full color from Avatar Press, starting this July.